Elegance meets simplicity in Cynthia Dunn Collections. Plates, mugs, cake stand, spoon rest, coasters, figurines and more to make your holiday merry. They are ideal for your holiday displays and serving needs, plus they make wonderful hostess gifts, too. 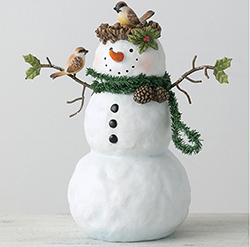 Visually abundant with tidings of joy, the adorable Snowman Collection, trimmed in red and featuring whimsical Cynthia Dunn artwork, perfectly captures the spirit of the season. A generous helping of functional design is what you get with Cynthia Dunn’s Cardinal plates and mugs. The edges are rimmed with a painted faux wood bark detail that makes the scene really pop when on display. Give a quintessential Italian gift this holiday season with the Vietri Old St. Nick collection. Handpainted by maestro artisan Alessandro Taddei, this timeless collection captures Babbo Natale spreading holiday cheer throughout the season. Handpainted in Tuscany, this whimsical collection is reminiscent of Vietri’s maestro artisan's childhood stories of Babbo Natale and his family traditions. Liquid Metal by Sergio Gutierrez, jewelry that merges vintage style with modern technology, meant to be worn daily, like a second skin. Liquid Metal Collection is a timeless style. The fusion of high fashion and durability form a signature mesh that makes each piece as unique as the person who wears it… handmade one-of-a kind made in USA. 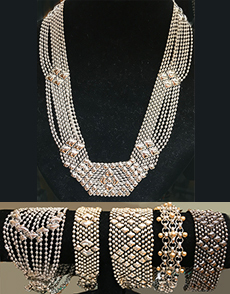 Each creation reflects the distinctive ball chain appearance that is the trademark of Sergio Gutierrez’s. Knit hats, scarves, and one-size fits all gloves will keep you warm and comfy as well as stylish. Come to The Butter Paddle to see the many varieties, as well as cozy throws to keep you warm on chilly nights. 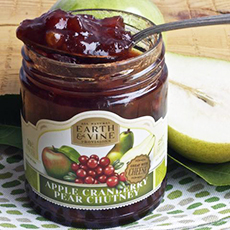 Earth & Vine Cranberry Apple Pear Chutney combines sun-ripened, Bartlett pears, Granny Smith apples and tangy Northwest cranberries to sweet perfection. The essence of fall has been captured in every jar. Stir into wild rice to complement pheasant, game hen, turkey or chicken. Pair with your favorite blue cheese, sliced apple, and crusty bread for an exquisite appetizer platter. Serve as a side dish with roasted meats and vegetables. 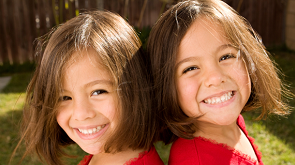 Are you looking for a rewarding volunteer job where you can be part of a great organization, make a difference in a child’s life, and be around gorgeous merchandise? The Butter Paddle is accepting applications for volunteers to work in our store. 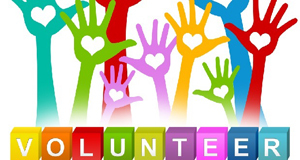 Our next group of volunteers will start in March, so if you would like to learn more about us or submit an application, please check out our website (www.butterpaddle.com) or contact EMQ Auxiliary Vice-President/Membership, Bobbi Stek, at info@butterpaddle.com. 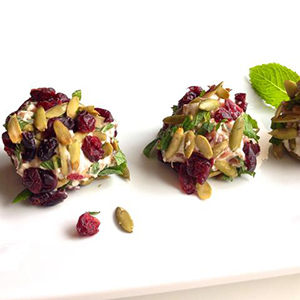 Tip: Substitute pumpkin seeds with peanuts or hazelnuts. Form 1 or 2 large cheese balls, place on larger plate with crackers.